All the Common Application prompts. Most prompts for major public universities around the country (including UC, Texas and others). I just purchased this book for my son to use. I read it today and love it. It is clear and engaging. I particularly like the way Ms. Robinson bolded the important parts–my son is much more likely to use it knowing he can just read the bolded than if he is faced with a long book to read. I love that she includes humor and plenty of examples. Wow. Why is this book not used more often? It’s simple and light to read, but actually gives concrete steps to follow in writing a college admission essay. My friend and I used this book and both got into universities with 4% acceptance rates; and we certainly didn’t get in due to our marks. This book is amazing. 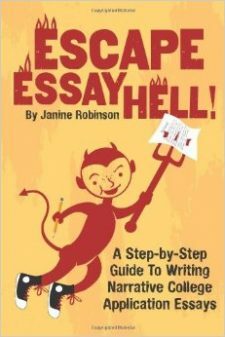 This guide made the daunting task of writing college essays so much easier for my son! We are so pleased we found this amazing resource! 5 stars My #1 Resource for College Essay Writing!!!!!!!!!!!!!!! I treasure this useful resource and have recommended it to all of my high school students. Most essay books will dance around the subject of essay writing. They can tell you how to recognize a good essay from a bad one and might even feature a few samples of general essay topics, but they don’t help the reader to get inspired about writing or how to show emotion. I have yet to find a great resource that goes right to the heart of essay writing until I found this book. Janine gives you a step by step approach for how to write a great essay. Her techniques can help students get right to the heart of essay writing in a fast, easy way. Students need to find their core characteristics and include this information in their essay in order to be noticed by collges. They also need to include details. I find that this book is a personal writing guide. Janine will coach you towards writing your personal story. If you are a high school senior,parent,teacher or college counselor, I urge you to purchase this book. This is the ultimate how to guide. Once you have this one, you will want all of the others in the series.